The holidays are here and like many of you, I will be hosting friends and family. We make more of a fuss over Christmas Eve dinner than any other meal, and, believe it or not, I’ve already got most of the meal planning complete. I’ve been recipe testing and tweaking dishes the last few weeks, and I’ve settled on a fun menu. Appetizers are the main attraction when my family gets together for Christmas Eve. My mom always makes a Mediterranean style Mezza tray with different types of smoked fish and cheeses. But my sister and her fiancé are vegan, so I like to provide a tasty vegetarian app for us to share. I wanted to create something a little fancy this year so I’ve been experimenting with tempeh. 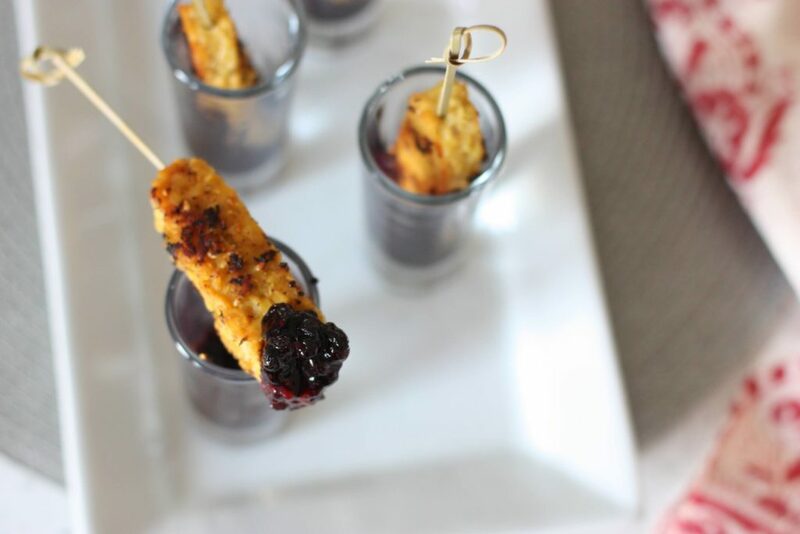 Inspired by a beautiful set of shot glasses I received as a gift, I created these to-die-for Coconut Crusted Tempeh Skewers with Wild Blueberry BBQ Sauce. 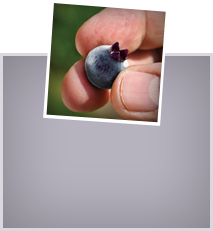 The Wild Blueberry BBQ sauce is so tasty and delicious; it’s literally finger-lickin’ good! It’s not too sweet and just a little bit tangy – it’s the perfect complement to the coconut crusted tempeh. 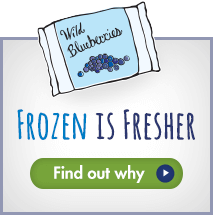 I love incorporating Wild Blueberries, which you find in the frozen food aisle of your grocery store, into my recipes! They always provide an intense fruity flavor and because they’re jam-packed with antioxidants, they offer a nutrition upgrade to any dish. 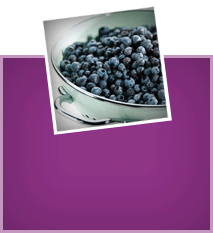 The Wild Blueberry BBQ sauce is super simple to make. Just simmer your frozen Wild Blueberries with some ketchup, apple cider vinegar, garlic and a little maple syrup and you’re ready to go. 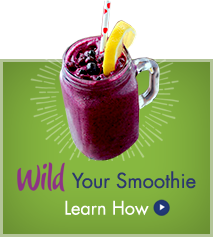 Wild Blueberries are not only rich in antioxidants; they also support heart and brain health. That’s not something you’ll find in your average holiday appetizer. If I were making this recipe again, there’s one thing I would suggest changing. Put more BBQ sauce in the bottom of the shot glasses! That sauce is so tangy and delicious, trust me…you’ll want more. Here’s to a happy and healthy holiday season! 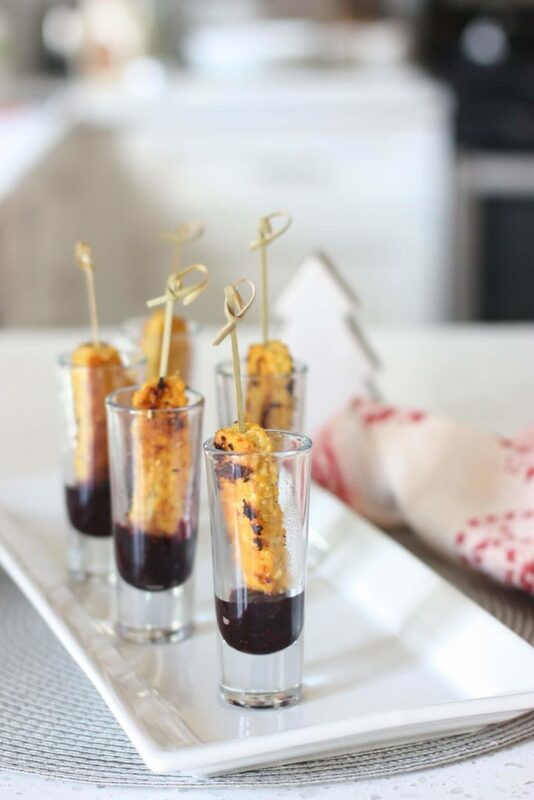 For more Wild Blueberry appetizer ideas, try my Wild Blueberry and Brie Pastry Bites or these Wild Blueberry Jalapeno Poppers. Melt the coconut oil and pour into a wide bowl. Whisk in the coconut milk, coconut flakes, sesame oil, soy sauce, sesame seeds, salt and spices. Slice the tempeh into ¼ inch thick strips. Place strips into marinade and let sit at least 15 minutes. 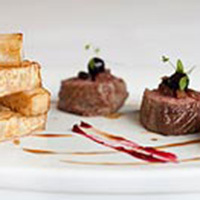 Make the BBQ sauce by simmering the frozen Wild Blueberries (directly from the bag – no thawing necessary) with the ketchup, maple syrup, garlic and vinegar. Bring to a boil and then let simmer on low until it thickens. After about 10 minutes, add the chia seeds and stir well. Let simmer for 5 more minutes and remove from heat. Heat a sauté pan with coconut oil on medium-high heat. Add the tempeh strips and sauté until golden brown. Flip each strip over and sauté other side. Remove from pan and let cool slightly. 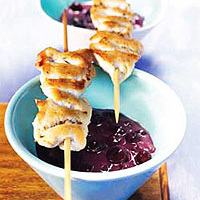 When cooled, skewer each strip. 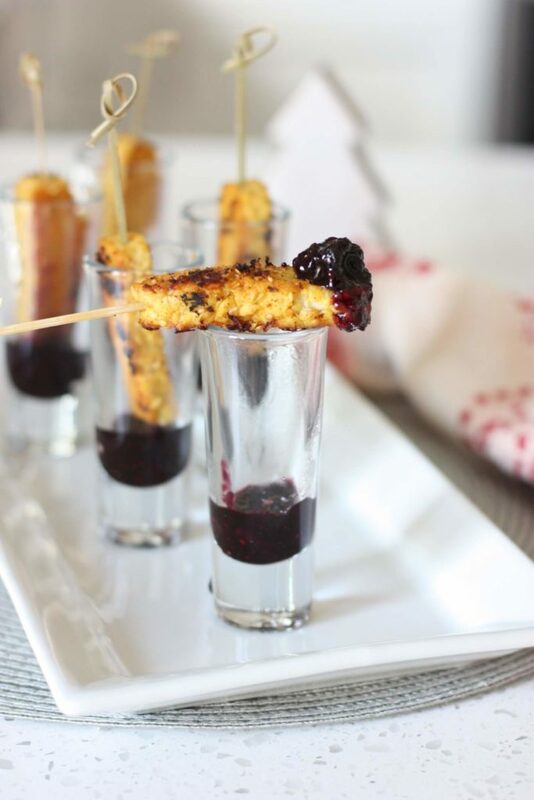 Serve in shot glasses with Wild Blueberry BBQ sauce in the bottom.